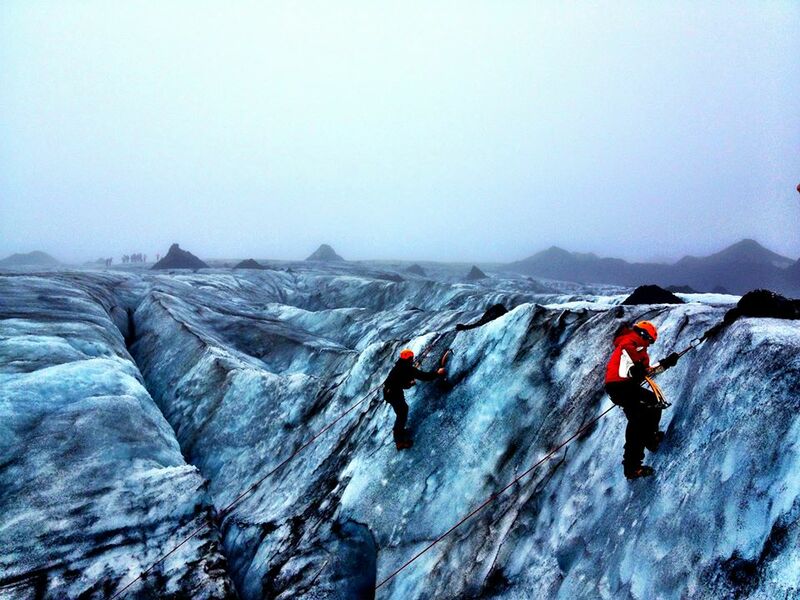 When planning our trip, we knew we wanted to get up close and personal to the glaciers. 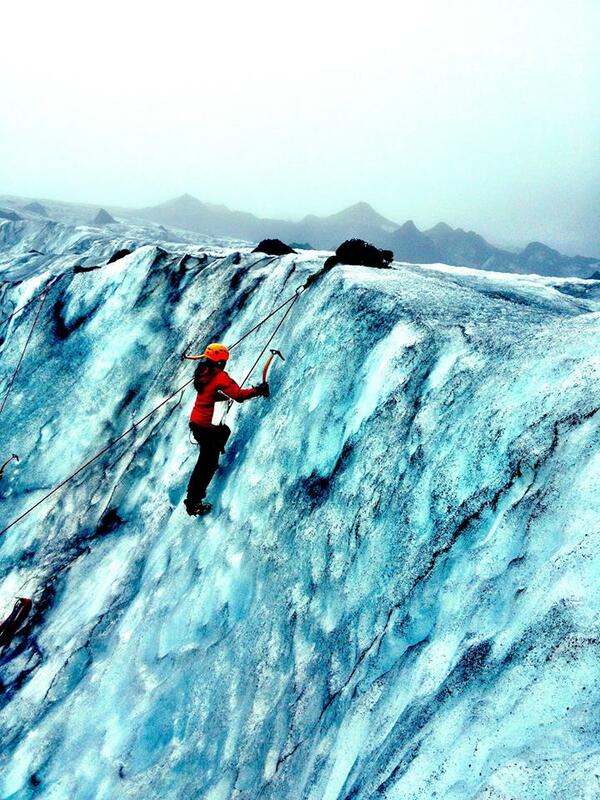 It wasn’t until we started looking at some of the tour options that we realized not only could we hike on the glaciers itself, but we could climb an ice wall! 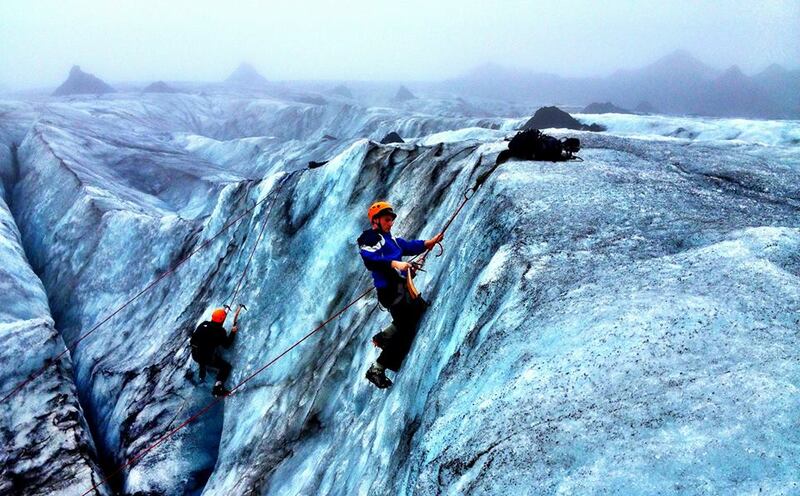 Through Arctic Adventures, we were able to experience one of the most amazing activities you could do in Iceland. Unlike the sunny day before, we were hit with a misty, lightly raining day, but that actually fit the mood of the activity we were about to partake on. The small and intimate van picked us up bright and early from our studio before stopping to pick up the rest of the group. Besides the three tour guides that were on board, there were only about 10 of us total on this trip which made it easier to follow along and get to know the others on the tour. It was a 3 hour drive to Sólheimajökull parking lot which flew by as we took in the vast landscape around us and the tour guides kept us entertained with stories about Iceland. There was never a dull moment in the van. The tour took us to Sólheimajökull, a frozen glacial tongue which is a rugged, raw and ever changing hub of ancient frozen water. 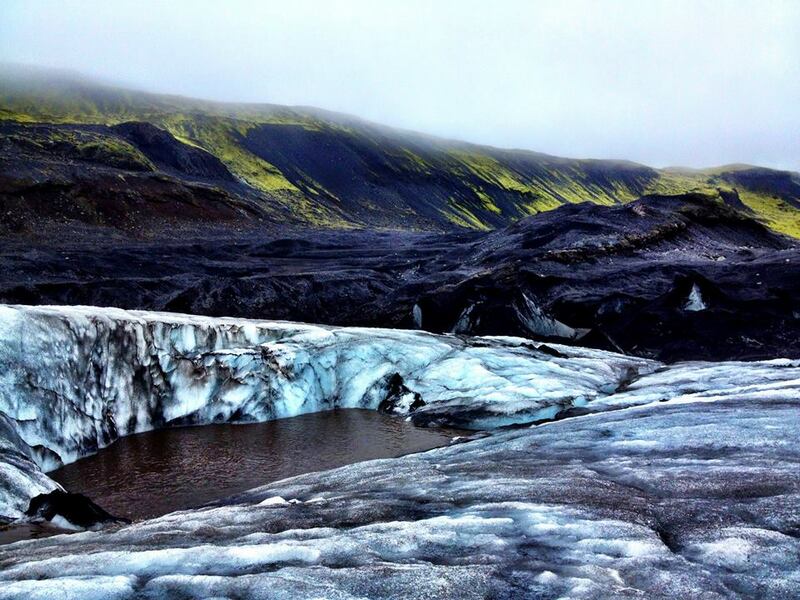 Approximately 11% of Iceland’s total area is covered by glaciers. Once we arrived at the parking lot, we got suited up with all our equipment. We only had to dress warm with waterproof clothes so we both wore our ski clothes, wool socks, beanie, gloves and thermal under layers. Sadly, this is what we wore most of the trip even when not on a glacier! (yes we are total LA people) They provided us with crampons, an ice axe and a harness for climbing later. (Note to self: don’t swing the axe around, I ended up slicing off a part of my pants and didn’t even realize it until later!) We got an intro into how to hike properly on the glacier with the crampons on and did a few test runs where we had to walk up and down a glacier so everyone felt comfortable enough before heading off. Hiking with the crampons was actually easier than it looked, the crampons stayed really snug on my shoes and I felt comfortable with them, never afraid my feet would slide out from underneath me even though we were walking on pure ice. We hiked single file through the glaciers, exploring all the amazing ice formations, sink holes and jagged ridges while getting briefed from the guides. 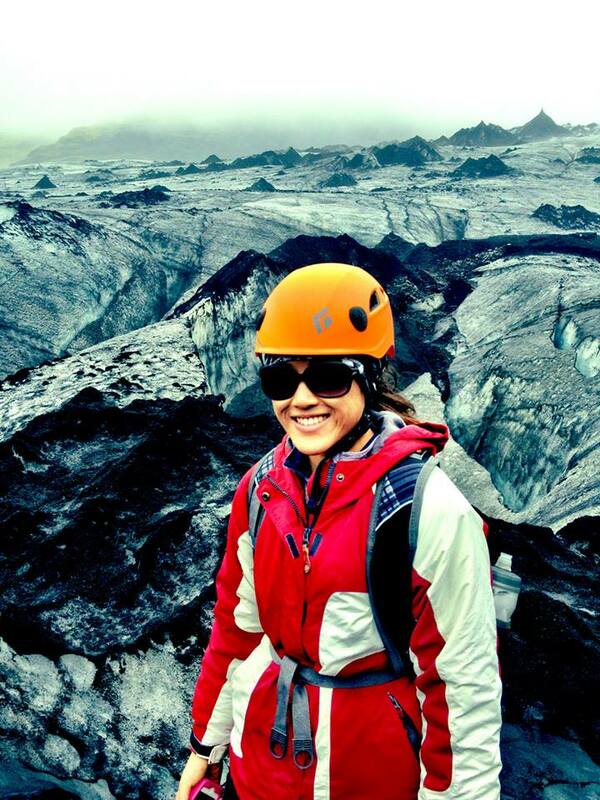 The mounds of black on the ice is actually volcanic ash that has formed on top of the ice. A subglacial volcano is formed by a eruption beneath the surface of the glacier and then melted into a lake by the rising lava. 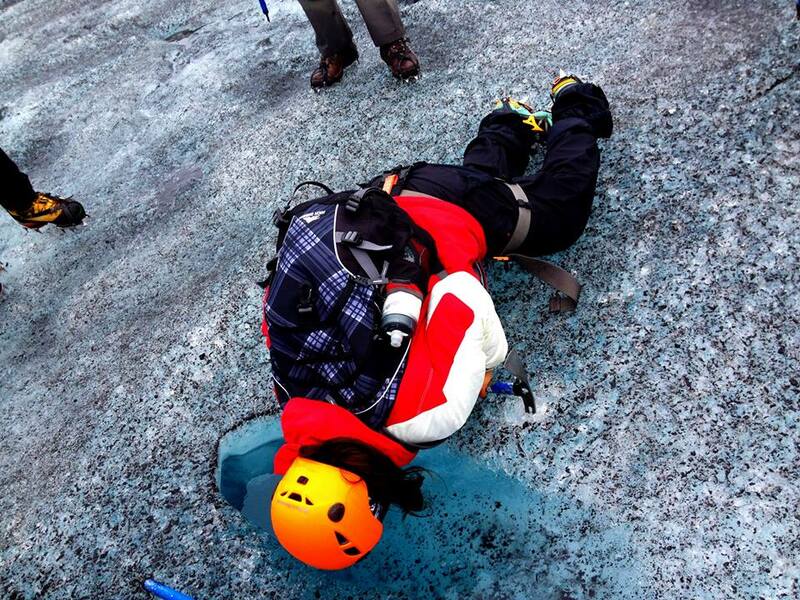 During the eruption, the heat of the lava from the subglacial volcano melts the overlying ice. The water quickly cools the lava, resulting in those of underwater volcanoes. Along the way, we stopped at a sink hole where the water is so clear and pure we all took turns drinking from it. I really liked how careful the guides were with the group. Safety was their number one priority and when we were able to look down a deep hole, they would make us go one by one while holding onto us so no one would slip in. After about an hour or so of hiking and exploring we made our way to the bottom of the ice wall where everyone was able to try their hand at ice climbing. We got briefed on how to climb the wall with the special axes and took turns practicing getting the ax securely into the ice, which doesn’t have anything to do with how forceful you are, but a quick flick of your wrist. There were two sections of the wall we could choose to climb on. One was just a face of an ice wall and the other was a little trickier because it had a hole opening that you had to find a way to go around. The two guides made their way to the top to secure the rope down. I got strapped in as the guide held down the other end of the rope. Surprisingly it was easier holding myself up as long as I leaned in and had a good grip on the axe. The crampons didn’t do much as it was really hard to jam the crampons into the ice wall, but once you got the axe in, you could literally free hang from the handles. It was that sturdy. I made my way to the top and rappelled down before letting someone else on the ropes. I would highly recommend wearing gloves while you’re doing this because the ice is a lot sharper than you think and it’s easy to cut your bare skin on it. After everyone had their turn, we packed up and made the hour trek back to the parking lot, stopping every so often to learn more about the glaciers we were walking on. Back at the van, the guides had a packed lunch of sandwiches ready for us which tasted so good after a day’s worth of activity. 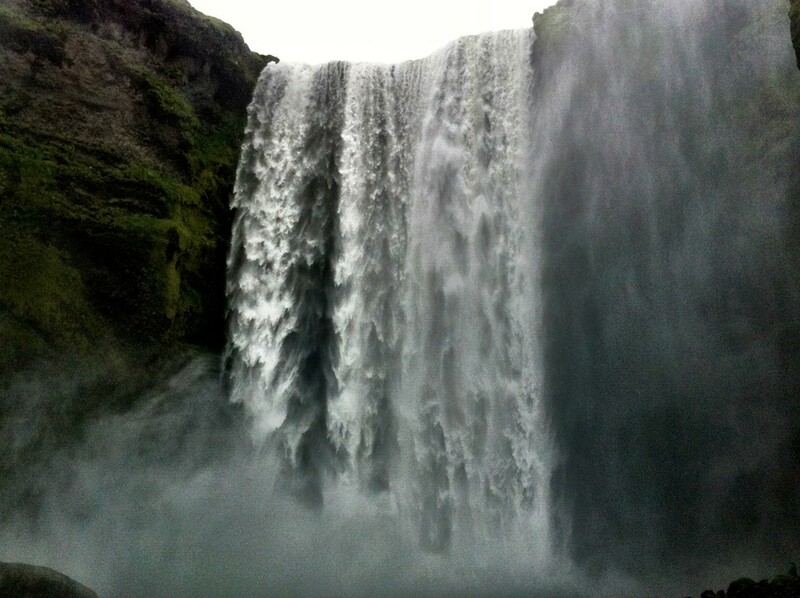 As we made the drive back to Reykjavik we stopped at the beautiful Skógafoss waterfall. 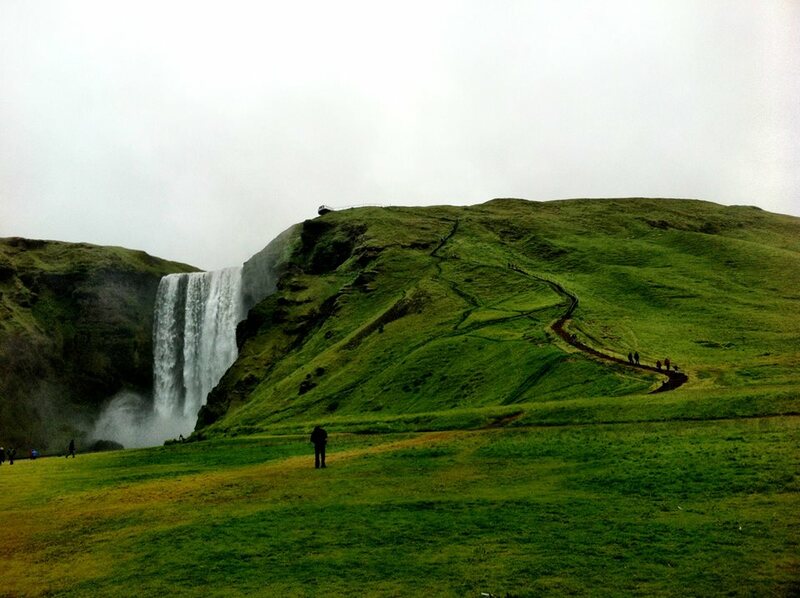 The Skógafoss is one of the biggest waterfalls in the country with a width of 82 feet and a drop of 200 ft. I was surprised by how you could walk right up to the base of the fall and feel the power of the water cascading down to the river below. We got completely soaked from the water, but it was worth getting an up close look at the waterfall. There is a little hiking trail to the right which takes you to the top of the fall as well. We had a great time with Arctic Adventures who not only taught us how to ice climb, but so much about the history of glaciers and where it’s currently headed due to global warming. 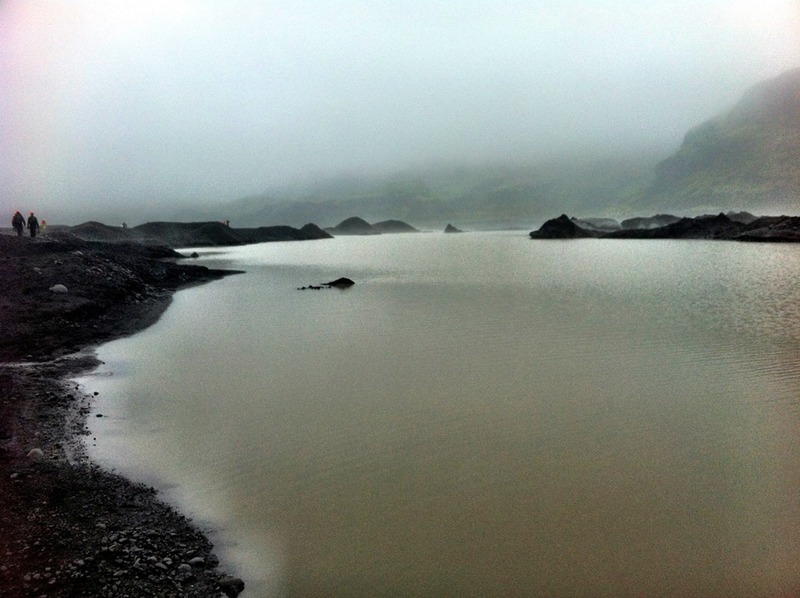 It was a long adventurous day and a must-do whenever in Iceland. 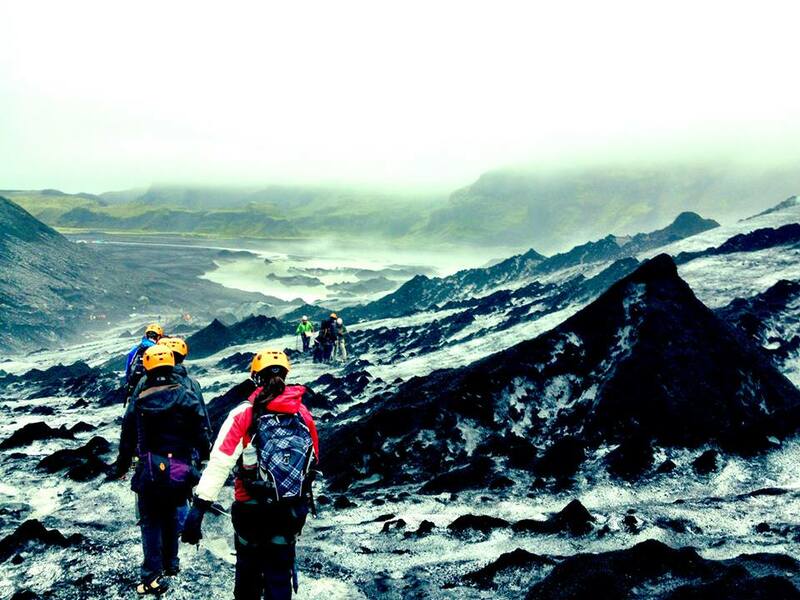 Arctic Adventures also does a bunch of other adventure tours or multi-day tours, such as rafting, mountain biking, caving, snorkeling and even hiking the famous five day Laugavegur trek from Landmannalaugar to Þórsmörk! 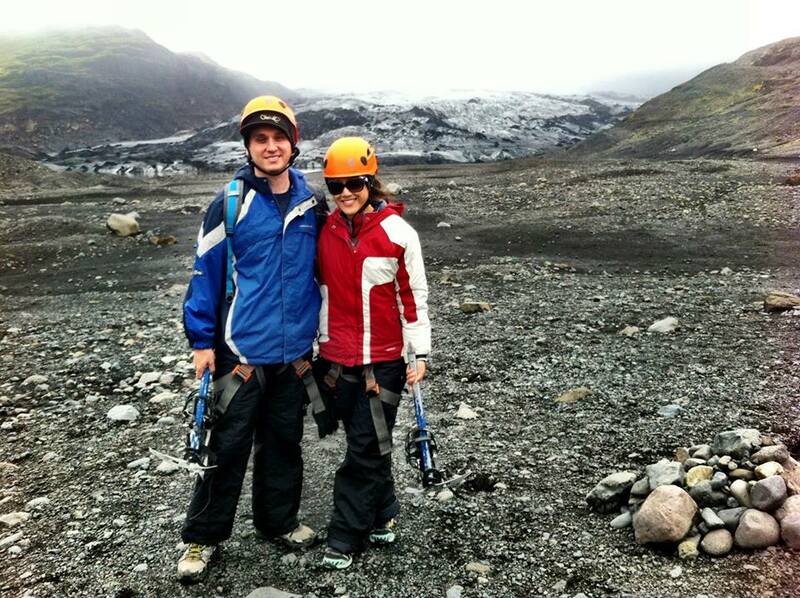 We loved this trip so much, we decided to book our rafting trip in North Iceland with them as well for the next day. Stay tuned! *Arctic Adventures was kind enough to cover our costs for this tour in exchange for writing about this tour. As always, all opinions are my own.